Why I picked it: I generally really enjoy Southern Lit, and this was a bargain buy from Amazon. Synopsis: Twelve-year-old CeeCee Honeycutt is in trouble. For years, she has been the caretaker of her psychotic mother, Camille-the tiara-toting, lipstick-smeared laughingstock of an entire town-a woman trapped in her long-ago moment of glory as the 1951 Vidalia Onion Queen. But when Camille is hit by a truck and killed, CeeCee is left to fend for herself. To the rescue comes her previously unknown great-aunt, Tootie Caldwell. In her vintage Packard convertible, Tootie whisks CeeCee away to Savannah’s perfumed world of prosperity and Southern eccentricity, a world that seems to be run entirely by women. From the exotic Miz Thelma Rae Goodpepper, who bathes in her backyard bathtub and uses garden slugs as her secret weapons, to Tootie’s all-knowing housekeeper, Oletta Jones, to Violene Hobbs, who entertains a local police officer in her canary-yellow peignoir, the women of Gaston Street keep CeeCee entertained and enthralled for an entire summer. Review: There is something about a book that is oozing with Southern charm that I can’t deny. Maybe it’s the foreign-ness of that kind of society that never fails to draw me in, or maybe it’s the rich descriptions of a slower kind of life, spent sipping sweet tea on a covered porch. 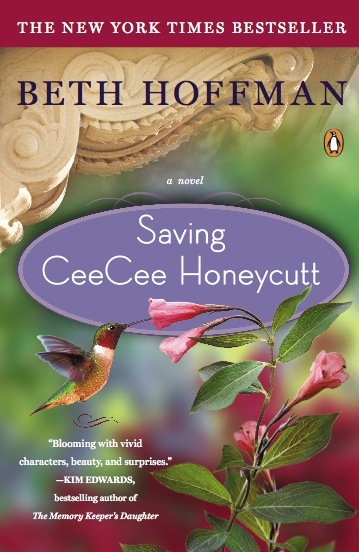 Whatever it may be, when I saw “Saving CeeCee Honeycutt,” in the bargain section at Amazon, I knew I just had to read it. The book is often compared to “Secret Life of Bees,” which was darling and definitely fit the “Southern Lit” criteria. Both protagonists are young women who are on the cusp of adulthood and discover much about life and family after spending a summer down in the South with very strong female role models. In CeeCee’s world, these women are from all walks of life and of all different races. As we follow CeeCee on her journey into acceptance with who is she and who her mother was, these women play an enormous role in getting her to that point. What I really enjoyed most about this book was Hoffman’s writing. Her descriptions were so rich and sweet! I really regret not tabbing the pages that had these right lines on them, so that I could go back to them later and just re-absorb the wonderful sentences. Hoffman really did a great job of balancing the different relationships in the book, without making any of the many characters “one note.” Each woman in the book can hold her own and I’d be interested to learn more about them all. My favorite was the lovable character of Oletta, who is the housekeeper in CeeCee’s new home. With her as one of the primary character, the very real subject matter of racial tension was touched upon, but in a way as to not overtake the core of the story – which was about the growth of a young girl. Overall, I would definitely recommend this book to fans of other books such as “The Help.” It was a short and sweet read that stuck with me. This entry was posted in Reviews and tagged 4-star, chick lit, historical, reviews, southern lit. Bookmark the permalink. Thanks so much for your lovely review of my novel. I’m delighted that you enjoyed CeeCee’s adventures and appreciate your kind words about my writing! 5/5 - Amazing!! Probably made me laugh out loud or cry. I was definitely a book that stayed with me after I read it. 4/5 - Great read! Captivating story - hard to put down. 3/5 - It was OK. Parts dragged or there were minor issues but overall, I'm glad I read it. 2/5 - Ugh. I guess it had a redeeming quality or two but overall, a bad read and not one I would recommend. 1/5 - Stay away! Glaring errors or badness that I cannot ignore. This book was so bad not only would I not recommend it, but I probably didn't even finish it.